In this inaugural annual report on energy investments around the world, the International Energy Agency (IEA) looks at the lifeblood of the global energy system: investment. The ability to attract and direct capital flows is vital to transitioning to a low-carbon economy while also maintaining energy security and expanding energy access worldwide. The success or failure of energy policies can be measured by their ability to mobilise investments.The new report measures in a detailed manner the state of investment in the energy system across technologies, sectors and regions. 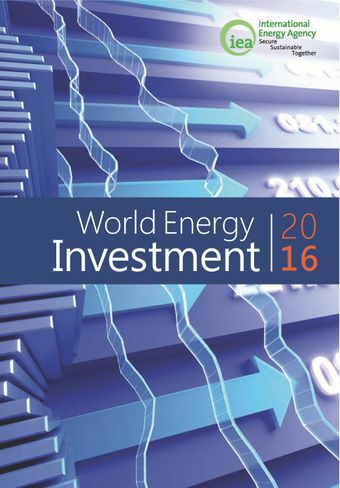 The analysis takes a comprehensive look at the critical issues confronting investors, policy-makers, and consumers over the past year.World Energy Investment 2016 addresses key questions, including :What was the level of investment in the global energy system in 2015? Which countries attracted the most capital?What fuels and technologies received the most investment and which saw the biggest changes?How is the low fuel price environment affecting spending in upstream oil and gas, renewables and energy efficiency? What does this mean for energy security?Are current investment trends consistent with the transition to a low-carbon energy system?How are technological progress, new business models and key policy drivers such as the Paris Climate Agreement reshaping investment?As a unique benchmark of current investment trends, World Energy Investment 2016 serves as a complement to the forecasts and projections found in other IEA publications and provides a critical foundation for decision making by governments and industry.